Explore a wrinkle in space-time -- or at least in the earth’s surface -- at Capitol Reef, a south-central Utah national park filled with canyons, cliffs, bridges, domes, and other unique rock formations. Surrounding the geological wonder known as the Waterpocket Fold, the park is known for its fairytale landscape, boasting a variety of landmarks like the Chimney Rock pillar, the Hickman Bridge arch, and Cathedral valley. Capitol Reef National Park is also home to over 2,700 fruit-bearing trees, situated in its historic orchards; cherries, peaches, apricots, plums, mulberries and more are seasonally available for fresh picking. Situated squarely in the desert, Capitol Reef sees less than 10 inches of rain per year, though it does experience some snowfall over its chilly winter. Daytime temperatures in July and August can climb past the 100 F mark, but the climate is generally temperate and pleasant, with highs in the 40s even in December and January. 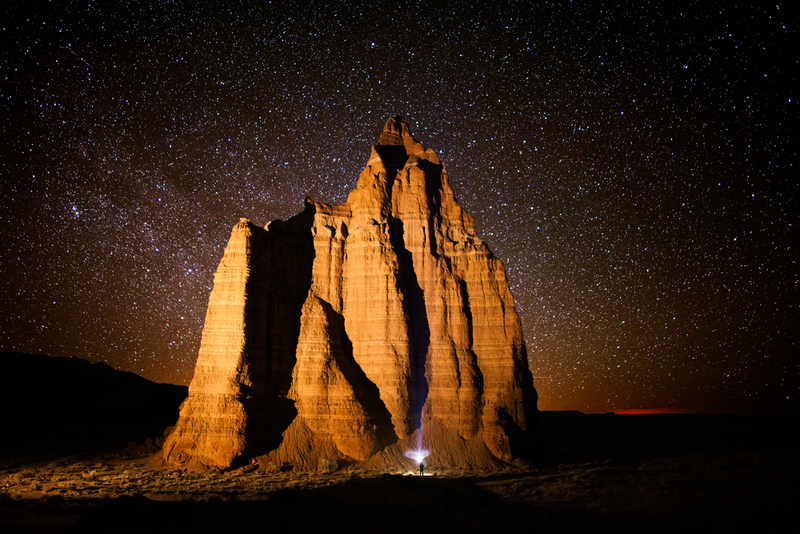 Although undeniably remote, Capitol Reef is served by a variety of small gateway towns which offer lodging, restaurants, and other attractions to visitors - the closest and bustling-est of which is Torrey. Park-goers can also reach Grover, Teasdale, and Bicknell within a few minutes, or the large city of Provo within two and a half hours. With hiking, biking, horseback riding, and backcountry camping opportunities galore, Capitol Reef draws thousands of visitors each year. Along with these attractions, the park also hosts a variety of ranger-led programs and activities, aimed both at increasing guests’ understanding of the landscape and offering expert perspectives on its iconic features. Click here to learn more about the ranger programs offered on a daily basis, and check out the park’s official events calendar at this page. While Capitol Reef only has one developed campground open to RVers, there are a wide variety of privately-owned RV parks to choose from in the area, as well as a few free and low-cost boondocking spots. To learn more about camping in and around Capitol Reef National Park, including important information about campground regulations and restrictions, click here. Whether you’re looking to stroll through the scenery or tackle a serious trek, you can find a hiking trail that fits your skill level at Capitol Reef. Along with fifteen day hikes ranging in length, terrain, and difficulty level, serious explorers can also tackle the park’s wide variety of backpacking and backcountry camping options. 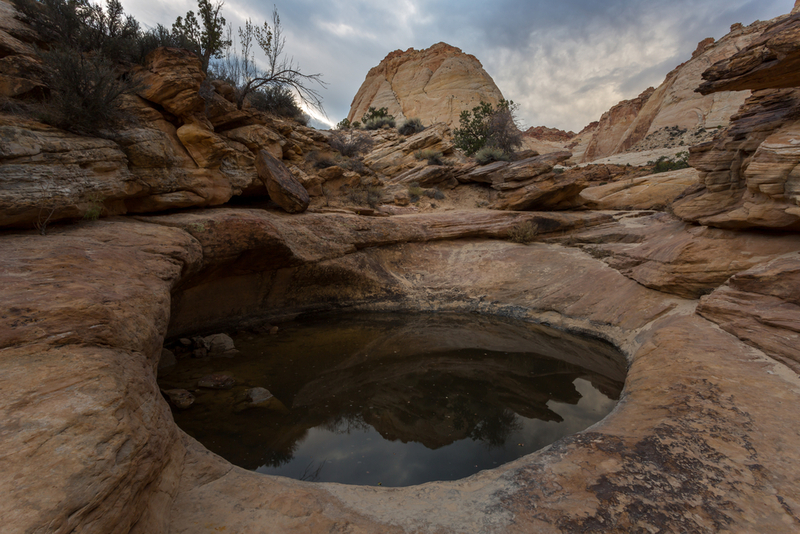 Below, we’ve listed some of the most popular and well-loved day hikes at Capitol Reef -- but for full details on all the available trails, visit the park’s official site. Terrain: A beautiful moderate hike which also offers rappelling opportunities for canyoneers. Terrain: A moderate-to-challenging hike, visitors climb a quarter mile of steep switchbacks before enjoying a relatively easy stroll along the top of the mesa at the edge of Waterpocket Fold. Excellent spot to catch the sunset. Terrain: This easy-moderate trail does see some elevation gain over its short length, but rewards hikers with views of its iconic, namesake natural sandstone bridge -- which spans an incredible 133 feet! Terrain: A lengthy and strenuous trail, but a fantastic way to get a panoramic view of the park in its entirety. Not for beginners. While you could easily keep yourself busy with the park alone for a lifetime, there’s way too much to see, do, and eat in Utah -- and you don’t want to miss out! Whether you’re looking for a life-changing burger or a chance to learn more about the people who walked these lands before us, you’ll find more than enough options to keep you occupied in the Capitol Reef area. The wide-open west is subject to a number of stereotypes, not all of which are accurate -- but its tendency toward hearty, cowboy-ready eats is more truth than fiction. Here’s where to grab a (big) bite before or after you work it off on the trails. Open seasonally between March 15 and October 31, the Broken Spur won TripAdvisor’s Certificate of Excellence in 2016 -- and once you taste their fresh-cut steaks, you’ll see why. It’s not a trip to the American southwest without some serious Mexican cuisine, so get yours at this local favorite. From nachos piled high with chorizo and fixings to classics like flautas, mole, and chimichangas, you’ll definitely find your favorite south-of-the-border fix here. Come in for a filling and affordable lunch or dinner at this casual joint, owned by locals who make their meals with love. Either way, you’ll find countless commerce opportunities in south-central Utah. Along with stocking all the gear you need to tackle the great outdoors however you choose to, this outfitter also offers guided horseback tours of the park. Gifts, groceries, and even a deli for fresh-cut sandwiches both hot and cold. Need to make a food run? Step up your grocery game at Mesa Farm Market. Hand-selected fruits and veggies picked daily from the garden, freshly-made goat’s milk cheese, house-baked bread… every single food item here is sustainable, local, and most of all, delicious. Hats, boots, jackets -- any cowboy worth his salt knows the outfit is half the fun. Situated inside the Saddlery Cowboy Bar and Steakhouse. 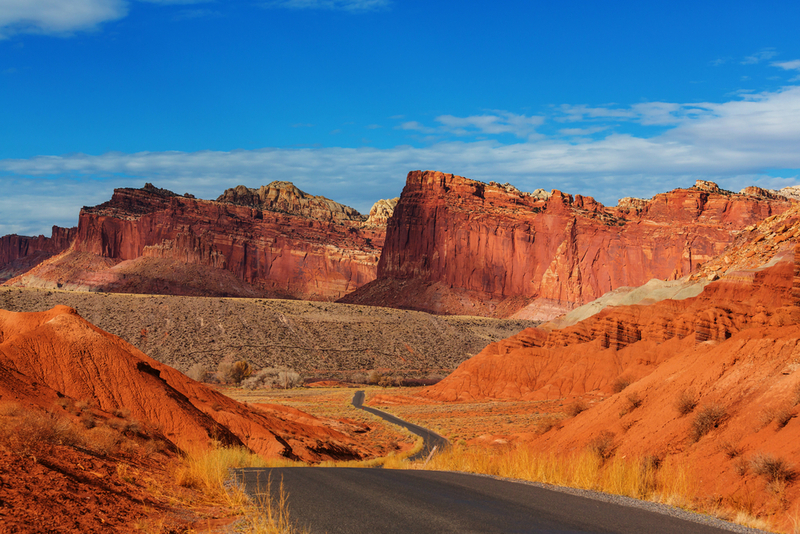 As much as we enjoy our time outside, we’d be remiss to miss out on the incredible cultural and educational opportunities in the Capitol Reef area. If you’re facing a rainy day (or you’re just in the mood to skip the sunscreen for a few hours), check out these nearby exhibits. These sacred lands were the homes of indigenous peoples well before we ever designated them as parks -- or even knew they existed. Come explore an ancestral Puebloan, or Anasazi, village, which was likely occupied as much as a thousand years ago. Includes a life-sized replica of an ancient dwelling. Situated on the campus of Southern Utah University, this museum features not only student and faculty art but also works by prominent regional artists who focus on the area’s unique landscape. Better yet: admission is free. With more than 370 square miles of stunning desert landscape to explore, Capitol Reef certainly offers no shortage of scenery. But you’re in Utah. And that means that one national park is just the tip of the iceberg. Utah boasts five national parks and innumerable state parks, national monuments, and other federal recreational areas. We’ll list a few unmissables below, but check out the NPS website for a complete list of other sightseeing opportunities in the area. Perhaps one of the most well-photographed and most recognizable locations in America’s vast national parks system, a trip to Arches is well worth the three-hour drive. If you get out to Arches, you can’t miss Canyonlands: it’s just a half hour further! Don’t forget to stop in the town of Moab along the way for lots of eating, shopping, and fun-having opportunities. It’s pretty crazy how much a two-hour drive to the south can change the scenery. To get a full picture of what Utah’s desert has to offer, don’t miss this nearby national park. Located inside Capitol Reef National Park property in the heart of the Fruita valley, the National Park Service and the Capitol Reef Natural History Association worked together to renovate this historic homestead. Stop by to get a taste of what life was like for rural Utah farmers in the early 1900s. If you can’t get enough of Utah’s iconic sandstone arches, head to this national monument just a two-hour drive southeast. As if the scenery weren’t enough to draw you, it’s situated on Utah’s famous Lake Powell, which means ample swimming, boating, and fishing opportunities await. If you don’t take a trip to Zion to wade the Narrows, did you even visit Utah? But in all seriousness, this sprawling canyonland was the first of the state’s five national parks for a reason. 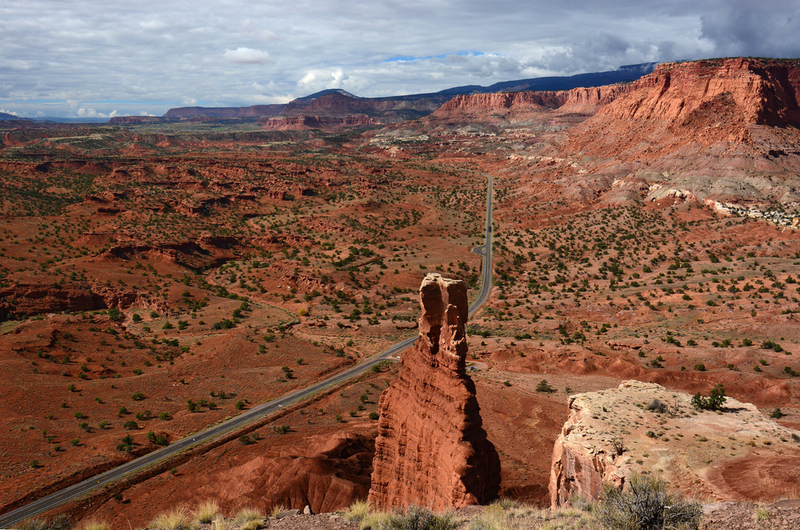 Although undeniably remote, Capitol Reef is serviced by a number of large interstate highways, including I70 and I15. For full details on how to approach the park by motor vehicle from a variety of orientations, check the park’s website -- and don’t rely on your GPS system, which can miscalculate routes in these remote areas. Flying in is another option, but due to the park’s location, you’re in for a drive, as well. The closest major airport to Capitol Reef is Colorado’s Grand Junction Regional, which is still 186 miles away; you could also fly into a relatively nearby hub like Salt Lake City or Denver. 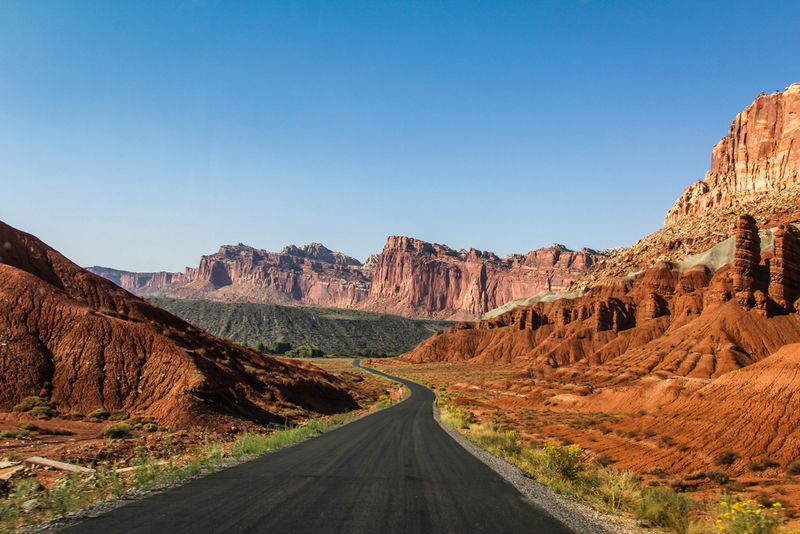 Whether you fly in and rent on-site or drive it from your hometown, we highly recommend you try out an RV for your Capitol Reef vacation. If you’ve never camped in a motorhome or travel trailer before, you’ll soon discover why it’s such a popular form of travel -- and growing in popularity year over year! RV camping combines all the best aspects of road tripping with the comforts and conveniences of home. And since there are so many campgrounds in close proximity to the park gates, you get a front-row seat for all the action. To learn more about RV rental opportunities in your area, check the listings at RVshare. Renting by owner can mean getting the same vehicle for a fraction of the price -- and since they’re actually used for vacationing, the rigs are usually even better! If you’re planning on visiting several of Utah’s national parks, or doing a larger tour of the American southwest (sometimes known as the Grand Circle), it may be worthwhile to invest in an America the Beautiful Pass, which gets you a year’s access to over 2,000 federal recreation sites for only $80. Here at RVshare, we’re always eager to share travel stories -- and we want to hear yours! Tag us in your photos and posts for the chance to appear on our own social media channels, or send the juicy details directly to us at [email protected]. Enjoy your trip!